While Shite’n’Onions has focused on Celtic punk and rock since inception there is one area of Celtic rock that we have never really touched on – \m/ Celtic Heavy Metal \m/. This omission is somewhat ironic as I first heard the mixing of traditional Irish music and rock through metal bands. My introduction to Celtic anything (with the exception of my parents Dubliners and Wolfe Tones tapes and successfully avoiding trad music at school) was through a band called – Mama’s Boys – 3 brothers from the North of Ireland raised playing traditional Irish music who discovered Horslips and had a Saul on the road to Damascas conversion from trad to rock’n’roll. Mama’s Boys recorded and toured throughout the 80s and while the infusion of Celtic sounds was somewhat sporadic (tracks like Runaway Dreams) it really perked up my ears. Small bit of trivia – Flogging Mollys’ Dave King was briefly singer for Mama’s Boys prior to joining the big league with Fastway (and former Mama’s Boys bassist and vocalist John MacManus now plays bass for Fastway). Mama’s Boys split in the early 90s after death of younger brother Tommy and the remaining brothers John and Pat want full into Celtic music with an band called Celtus who had moderate success in the UK. With my interest pricked I delved into Thin Lizzy’s back catalog and especially stuff like Emerald (please Flogging Molly cover this!) and the amazing Black Rose. While Lizzy never incorporated traditional instruments the guitars shreaded Celtic melodies like you wouldn’t believe. Thin Lizzy lead me to Gary Moore and his 1987 Wild Frontiers album – the most complete Celtic metal/rock album I had heard to date – Moore took Lizzy’s Black Rose (which he played on) and added trad instruments – fiddles and uilleann pipes – and was joined by members of The Chieftains to make the ultimate tribute to the late Lizzy front man Phil Lynott. And that was really my Celtic rock world (and yeah The Pogues existed but when you did the metal then that was all you did) through the early 90s. My interest in Metal wained in the early 90s as I opened up to newer sounds – Therapy?, That Petrol Emotion – and metal changed when Kirk Cobain slew big the beast that was hair metal and I didn’t like the sound of the new flavors of the month from Kerrang!! – Sepultura and Pantera and all the various shades of black, death and fart metal. One band I did catch by chance playing live around that time was Skyclad – the originators of Folk-Metal – thrash meets Lizzy”s Emerald with a full time fiddle player to boot – Skyclad were to open for Danzig in Dublin but Glen stubbed his toe and Danzig pulled out – Skyclad pulled together a last minute gig in a biker bar in Capel Street and they were amazing (audience filled with guys in kilts with clamors and this was pre-Braveheart). Skylclad had started something for the metalheads of Dublin. Me, I moved and moved on musically. Interestingly both Celtic punk and metal bands stick within the musical structure of their respective genres. While the punk bands will see their roots in The Pogues and their forefathers The Dubliners and that drinking, fighting, rebel ballad tradition. The metal bands reference Horslips and further back to The Chieftains and focus on Celtic mythology and pre-history – the scally caps are replaced by blue face paint. So, 17 years on there is now a whole sub genre of Celtic Metal with bands from Ireland, Germany and as far a field as South America. The scene developed first in Ireland and was primarily influenced by the aforementioned Skyclad and Horslips – early and influential Irish bands were Cruachan, Primordial and Waylander who all took the lead from Skyclad and combined trash/black metal with traditional Irish folk in a Horslips goes metal style. 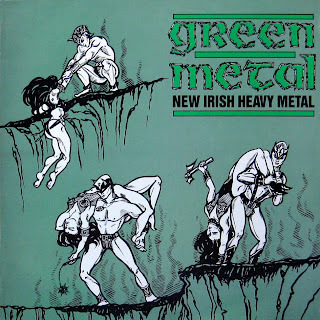 Celtic metal bands from Ireland including Geasa and Mael Mórdha and bands cropping up in places as diverse as Switzerland (Eluveitie), Spain (Mägo de Oz) and Germany (Suidakra). Cruachan – Founders of Celtic metal waaaaaay back in 1992. Founding member Keith Fay was inspired by Skyclad and took what they were doing and added a Celtic dimension. Horslips were another big influence. Originally Cruachan were a black metal band infused with traditional Celtic music though their metal sound has moved more towards traditional heavy metal. Cruachan will be the band most familiar to Shite’n’Onions readers as Shane MacGowan co-produced their album Folk-Lore. Shane-o also contributed vocals to versions of “Spancill Hill” and “Ride On” on that album. Eluveitie are a Celtic metal band from Winterthur, Switzerland founded in 2002. Switzerland was of course the original European home of the Celt’s. Eluveitie often sing in Gaulish (an extinct Celtic language). The band had decent chart success with their last release Slania in both the Swiss and German charts. Geasa are a Celtic metal band from Dublin, started in 1994. Their style is traditional Celtic music merged with black metal. The band has released one demo album, one EP, and three full-length albums. Mael Mórdha (founded 1998) are also from Dublin and play Celtic doom metal (ie Black Sabbath at their most depressed.) They describe themselves as “Gaelic doom metal”. The band tried to enter the Eurovision Song Contest 2005 as Ireland representative. Mägo de Oz are from Spain and have been around since 1988. Their style is more traditional heavy metal (ie Iron Maiden) meets Celtic (band members included a violinist and flautist). Mägo de Oz has had some serious success in Spain and South America. Primordial – are from Dublin and along with Cruachan are the Granddads of Celtic metal. The band was formed in 1987 and added a Celtic bent to their black/doom metal sound in the early nineties. Suidakra are a melodic death metal (if you can imagine that) band from Germany with Celtic influences. Waylander are from Norn Ireland and play more traditional heavy/power/trash metal with Celtic influences. The band were formed back in 1993 and were part of the first wave of Celtic metal bands emerging from Ireland – as with Cruachan, Horslips were a huge influence. Celtic Legacy were another Irish band that were around from the mid-nineties to 2010 (they basically went broke trying to finance their own stuff). 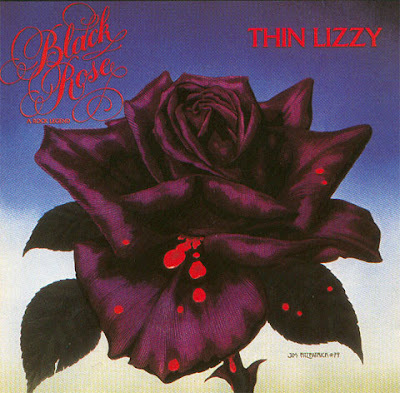 The band were heavly influenced by Thin Lizzy at their Celtic best.